Well, yesterday was an interesting day! Rain by the bucket load, but not enough resilience to handle it. Yes, there was apparently 8 times more rain than normal, and enough water landed on our streets in half an hour to equal a normal rainfall for a month, or something like that, but still – it should hardly have been the end of the world. A fairly unprecedented transport disaster – both road routes blocked, and all the rail lines out as well, leaving Wellington devoid of transport links – except, of course, ferry, airplane, on foot, and by cycle. all routes on land were washed out, meaning that the rest of the country was tragically cut off from the capital. I don’t know how Auckland coped without our constant support. Yet the city performed reasonably well, I thought. Yes, the low-lying wet spots of Kilbirnie and Karori will have filled up, once again, to the brim, but apart from that, a deluge this size seems to have been swallowed up by the drains and disposed off out to sea. Well done Wellington City Council! Not such a good report on other places – Petone, Porirua, Paraparaumu, Paekakariki, Pukerua. Does blame for that lay at the feet of NZTA, or the Wellington Regional Council? Karori – low-lying? We’re practically mountain dwellers out here in the wild west! Any flooding out this way is usually just a bit of surface flooding where the drain gratings have been blocked up by plant litter. I always make sure my closest one is clear of such matter before heading off to work on rainy days. I haven’t actually seen any flooding around recently, although I know it has been reported. 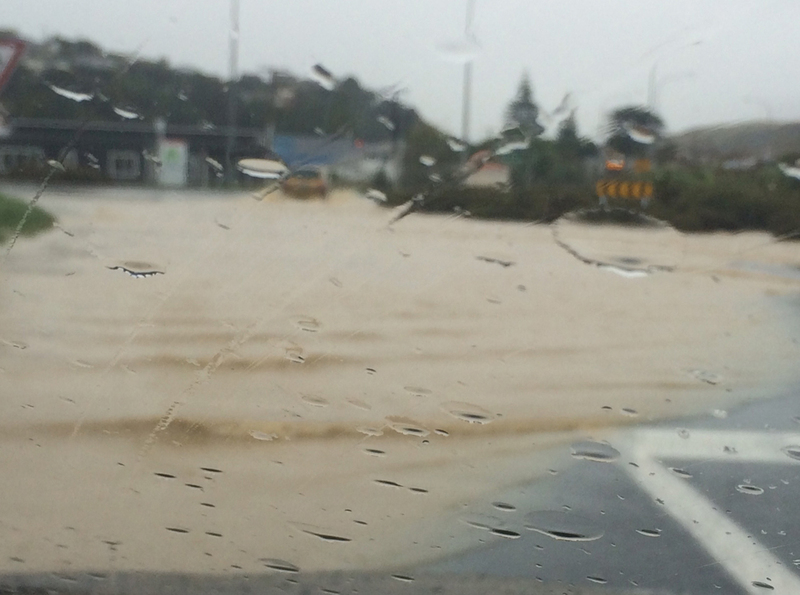 Korokoro Stream blowing its load all over the Petone interchange was to blame for a lot of commuters misery. One thing that I don’t get, re: the East-West ferry, is why have they have not fixed the “storm damage” on the Petone jetty from something like TWO YEARS AGO. This would (by only a minimal %age) alleviate the pressure on the SH2 but something is better than nothing. Come on GWRCm what is the hold-up?! Yes, there was a lot of rain, but really… It rains here, and it blows and it shakes, and we should be prepared for that. The impact on the motorways and railways was mostly (not entirely, but mostly) preventable with some forethought. But m-d : you can’t say that Karori is on a mountain top – it’s distinctly a Sleepy Hollow, fog-filled, Headless Horseman, type of place. It’s not just water that can’t escape from that particular mountain-top…. …but, yes. Sea Monkey – I’ll see if we can find out if anyone from GWRC reads this. I know that WCC do, sometimes, but you are correct that they certainly should do something about it. Perhaps they were waiting for a massive storm to wash it away before they did anything. They may have got their wish. And Chico – yes, absolutely.